In the past few years, online videos have become a regular part of our day. You can’t scroll through Facebook or Instagram without running into one almost immediately. And, this has made video marketing one of the best options to reach your audience. But, does the thought of recording a VSL leaving you shaking like a leaf? The good news is, you’re not alone. So, to help you keep it together, today, we’re going to look at four VSL lessons you need to know from none other than serial entrepreneur Gary Vaynerchuk. You may know Gary from his #AskGaryVee show on YouTube, one of his five (yes, FIVE!) books, or heard him speak live. He’s certainly left his mark on the current marketing world by being so forthcoming with his business insights. Thus, by tapping into one of his talks at last year’s South by Southwest (SXSW) Conference, we’ve got four takeaways you can use in your VSLs. Gary is not afraid to be himself when he speaks. He curses often and is brutally honest with his audience. Doing just that strikes a chord with people because it’s refreshing. In a world where it’s easy to slip into corporate speak, it’s nice to hear how business really is. No hiding behind the curtain. That said, don’t be afraid to be you. Find your tone of voice and speak to your customers openly and honestly. From the moment Gary starts his talk and down to the last second, he is ALL in. He’s right there in the moment giving you his best energy. Follow his lead! Remember all the things that got you excited about your product or service, and transfer that excitement into your VSL. Your belief in your creation should come across clearly because you want your potential customers to believe in what you’re selling, too (all the way to clicking your call to action button!). This will help you avoid falling into the trap of monotone monologues. Empathy is what Gary attributes to him being a good salesperson. It injects power into relationships. If he understands what you’re thinking, he can reverse engineer it to make a sale. So, go ahead and learn how to empathize with your potential customer. Know what they need, the questions they have, and how you can solve their problems. Gary’s number one tip for public speaking is giving 100% of your energy to what brings value to your audience. Most public speakers are simply doing a press appearance, so to speak, for their company. That said, cater to your listeners. Get to know them and what is most valuable to them if you want to be successful. Incorporating these tips into your VSL will ensure you make it a winner. And, to come up with a conversion-worthy script that even Gary can approve of, check out your new copywriting best friend—ScriptDoll. It’s what entrepreneurs just like you are using to write their sales copy for them. In a matter of minutes, you can input your business and client information into the software to get copy that’s tailor-made for your needs. The best part? You can try it out for only $1. So, what are you waiting for? 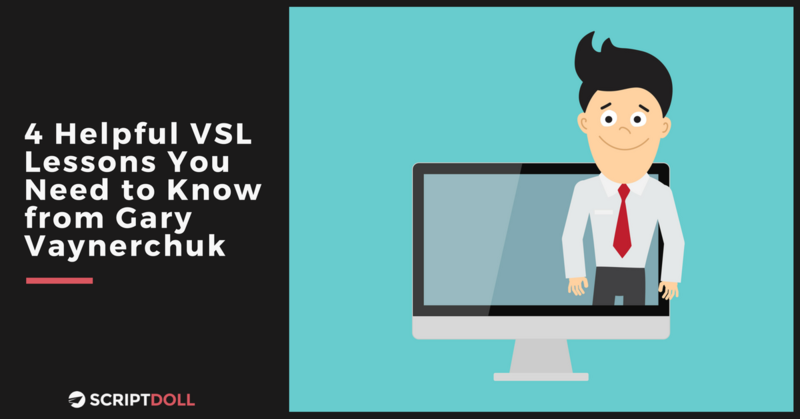 Click the banner below and get one step closer to rocking your next VSL today!